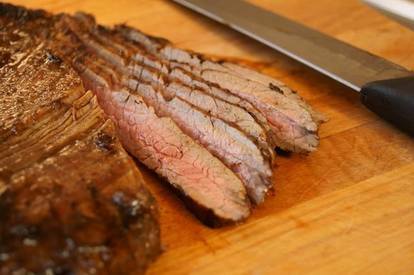 Grilled coffee balsamic flank steak! i love coffee. I love a perfect cup in the morning. I love it in my ice cream pie, and in my cookies. And now, I love it on my steak! Both the marinade and the sauce in the recipe are filled with the aromatic, deep, rich flavors of coffee. Add a touch of sweetness and a hot grill, and you’ll create an unbelievably delicious steak. This is a great one to add to your weekend recipes — you’ll only spend a few minutes making the marinade, then let it sit overnight, and the next day it’ll take less than 10 minutes to grill.